One of the weird things about running a cinema is that you very rarely get a chance to go to the cinema (other than your own). 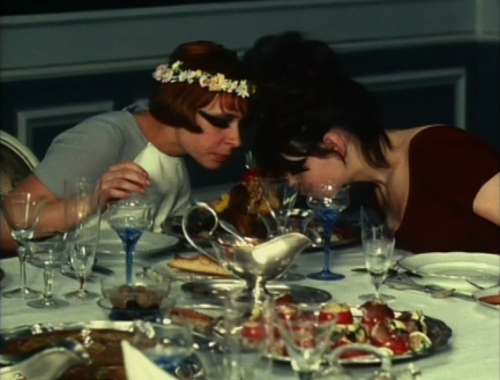 So it’s a treat to hop on our bikes and pedal over to WORM for a screening of Věra Chytilová’s Daisies. Tbe 1966 feature, completed a couple of years before the Prague Spring, follows the antics of two 17-year-old girls who decide that since the world has gone bad, they’ll go bad too. The film proved so provocative to Czech authorities, Chytilová didn’t work on her home turf again until 1975. Madcap feminist farce with loads of giggling, fantastic fashions, feasting, drinking, dancing, collaging and a whole bunch of scrumptious cinematic eye candy, Daisies makes me miss all my dear EPFC youth class wild girls… Carla, Tati, Penelope, Camilla, Tanji, Mia Valentina and Ashley: this one’s for you! OK, I’ll bite, Why is the woman on the left covered in what looks like Cake? I’m thinking a food fight broke out & she lost! You win the prize, Dad! Food fight with cake! No losers here, though… Later they both end up swinging from the chandelier!